Hundreds of Taliban militants launched a major assault on a provincial capital in Afghanistan, killing at least 14 members of Afghan security forces before being pushed back with the help of U.S. air power, Afghan and U.S. military officials said. The August 10 attack on Ghazni, some 150 kilometers southeast of Kabul, also wounded at least 20 members of the security forces, said Baz Mohammad Hemat, the administrator of the Ghazni city hospital. 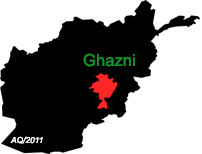 The attack on Ghazni, the capital of the province with the same name, began early in the morning, with heavy fighting in several areas of the city, according to provincial police chief Farid Ahmad Mashal. Mashal said there were more than 100 casualties but he could not give a breakdown of the dead and wounded. He said most of the casualties were militants. The army helped the police bring the city back under the control of government forces, Defense Ministry spokesman Mohammad Radmanish said. U.S. warplanes, drones, and helicopters came to the aid of the Afghan forces before they managed to repulse the Taliban assault. “U.S. forces responded with close-air support (U.S. attack helicopters) and conducted one strike (drone). In addition, U.S. aircraft conducted a show of presence,” Lt. Col. Martin L. O’Donnell, a spokesman for U.S. forces in Afghanistan, told TOLOnews. O’Donnell said the fighting ceased at around 8 a.m. Kabul time. However, some residents reported that sporadic gunfire could still be heard in the city by mid-morning. The fighting prompted authorities to close the highway linking Ghazni to Kabul, and police special forces helped block the Taliban advance on the city. After repulsing the attack, police conducted house-to-house searches for any remaining Taliban fighters. An investigation was also underway into how the insurgents had managed to infiltrate so deep into the city, officials said. But Mashal rejected the claim, saying that sporadic clashes were ongoing only on the outskirts of the city — in the Khogyani, Khwaja Omari, and Zanakhan areas. Several bodies of dead Taliban fighters remained on the street after Afghan forces pushed the militants from Ghazni, Mashal said. He said the bodies of 39 Taliban fighters were recovered from under a bridge on the southern edge of the city. The Taliban have so far not confirmed being behind an earlier attack in the western Herat Province in which at least six police officers were killed at a district checkpoint. A U.S.-led coalition drove the Taliban from power after Al-Qaeda militants whose leaders were being sheltered in Afghanistan carried out the September 11, 2001, attacks on the United States. Taliban leaders have ignored an offer by the government to conduct direct peace negotiations.